Aren't you tired of twisting knobs? 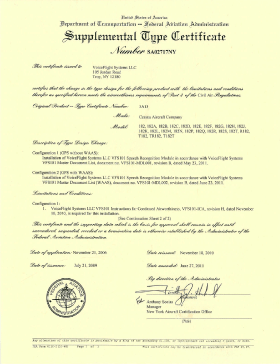 VoiceFlight's VFS101 is the world's first speech recognition system to be certified by the FAA for use in civilian aircraft. The system allows pilots to enter waypoints and airways into their GNS-430/530 GPS units up to ten times faster than is possible using the tedious concentric knobs. Our short video demonstrations illustrate the exceptional speed, accuracy, and convenience of the VFS101 system. The true measure of the system, however, is reflected in the testimonials of those already using the system for their routine flight operations. Due to competitive market pressures, especially extension of the Flight Stream 210 to the GNS series navigators, VoiceFlight reluctantly discontinued the VFS101 product line in September of 2014. There are a small number of new production units still available from the VoiceFlight EBay Store. The VoiceFlight User Nav program reports "2 ParseErrors" when processing the 6-Dec-2018 NASR Nav data from the FAA. These parse errors are an unfortunate result of the way that the FAA distributes the NASR Nav data. In particular, the FAA updates the FIX file on a 28 day cycle, but only updates the corresponding AWY file on a 56 day cycle ! In this case, the RAPEN fix (in North Carolina) was removed and renamed to JAYDB in the FIX file, but the AWY file (still on a 56 day cycle) unfortunately still references the missing RAPEN fix in the airway definitions of V1 and V139 ! If the VFS101 and VoiceFlight User Nav program are operating as designed (which we have not verified for this specific instance), the V1 and V139 airways should be broken into two distinct segments (at the RAPEN waypoint) which will each function properly on their own, but the VFS101 will not allow the pilot to enter an airway segment which -crosses- the (missing) RAPEN fix. Initial field reports indicate that the VFS101 does successfully operate with Garmin's GNS 430W / 530W Main S/W Versions 5.30 and 5.40. We have not internally tested/confirmed either of these configurations. Please note that these GNS Main S/W versions are not officially included in the latest VoiceFlight STC/AML (dated September 17, 2013). Also note that all VoiceFlight customers (whether running with an old or new version of the Garmin GNS Main S/W) should be running the VFS101 Version 3.2.3 software released in September 2013. Please note that the VFS101 User Nav Update program (that generates Navigation Update files for the VFS101) is only compatible with the traditional GNS430/530 Navigation Data Updates from Jeppesen, and will not currently work with the new GNS430/530 Navigation updates available from Garmin. If you wish to continue using your VFS101, please contact VoiceFlight before switching to the Garmin Navigation Data updates. 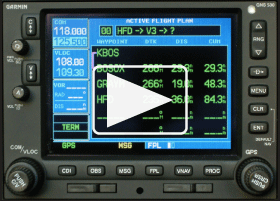 VoiceFlight is aware of at least one instance where a VFS101 customer has subsequently installed a Garmin Flight Stream 210 (FS210) and uses both systems to update flight plan information on a GNS530W/430W. This particular equipment configuration has not been evaluated or tested by VoiceFlight (nor to our knowledge by Garmin). Given the substantial complexities of the GNS crossfill protocol and the unknown impact of FS210 interactions on that protocol, VoiceFlight does not believe that the slight incremental benefit of having two auxiliary methods of flight plan entry justifies the additional risks that may be present in this configuration. As such, VoiceFlight recommends that VFS101 customers select a single "auxiliary" flight plan entry method - either a VoiceFlight VFS101 or a Garmin FS 210, but refrain from trying to utilize both methods in a single installation. If the FS210 method is selected, a formerly installed VFS101 can be disabled by removing power from the unit until such time as the unit is physically removed. A new version of the VFS101 User Nav Application is now available. This version is necessary to circumvent an error present in the FAA's NFDC data for Cycle 1706. Please note that "1 Parse Error" will be reported when processing the Cycle 1706 FAA data with the new application. This is because the Q41 airway is defined with a non-existent WILEP waypoint. The new VFS101 User Nav Application (Version 0.8.7.0) works with either JSUM or JDM downloads. All VFS101 Users are encourage to install this version on their Windows computer by clicking the icon to the right and then selecting run. Note: After installation, you should see "Version 0.8.7.0" in the title bar of the VFS101 User Nav application. If not, please manually delete the old version (Control Panel : Uninstall Program) and reattempt installation. Version 3.3.0 of the internal VFS101 software offers even better speech recognition, along with improved error messages and system usability. This VFS101 software update has not been reviewed or approved by the FAA and as such is suitable only for Experimental aircraft. If you would like to update your VFS101 with this software, please contact VoiceFlight to request a copy. A new version of the VFS101 User Nav Application is now available. This version is better able to locate the required files for various computer configurations. It is also signed with a SHA256 Certificate as per recent Microsoft requirements. The new VFS101 User Nav Application (Version 0.8.6.0) works with either JSUM or JDM downloads. All VFS101 Users are asked to install this version on their Windows computer by clicking the icon to the right and then selecting run. Note: After installation, you should see "Version 0.8.6.0" in the title bar of the VFS101 User Nav application. If not, please manually delete the old version (Control Panel : Uninstall Program) and reattempt installation. Field reports indicated that the VFS101 -does- successfully operate with Garmin's GNS 430W / 530W Main S/W Version 5.20. We have not internally tested/confirmed this configuration, but have two customers that have reported successful upgrades to the 5.20 firmware. Please note that this GNS Main S/W version is not officially included in the latest VoiceFlight STC/AML (dated September 17, 2013). Also note that all VoiceFlight customers (whether running with Garmin's Version 5.20 Main S/W or not) should be running the VFS101 Version 3.2.3 software released in September 2013. Jeppesen is in the process of migrating users from the conventional JSUM downloads to a new Jeppesen Distribution Manager (JDM). A new version of the VFS101 User Nav Application is now available (and required) for VFS101 users that migrate to the new Jeppesen Distribution Manager. The new VFS101 User Nav Application (Version 0.8.5.0) works with either JSUM or JDM downloads. To install on your Windows computer, please click the icon to the right and select run. Note: After installation, you should see "Version 0.8.5.0" in the title bar of the VFS101 User Nav application. If not, please manually delete the old version (Control Panel : Uninstall Program) and reattempt installation. VoiceFlight will not have a booth at EAA AirVenture this year. However, if you would like to chat with Scott Merritt, VoiceFlight's President and Founder, he will be at the SteinAir booth on Wednesday from 11 to Noon. A new version of the VFS101 User Nav Application is now available. To install on your Windows computer, click the icon below and select run. This version restores identifiers for some smaller airports that were omitted in past versions. More specifically, three character airport identifiers that begin with a letter but include one or more digits in the subsequent character positions (e.g. X14). The new version is also more adept at automatically EJECTing the USB Flash Drive at the end of the update process. Note: After installation, you should see "Version 0.8.4.0" in the title bar of the VFS101 User Nav application. If not, please manually delete the old version (Control Panel : Uninstall Program) and reattempt installation. 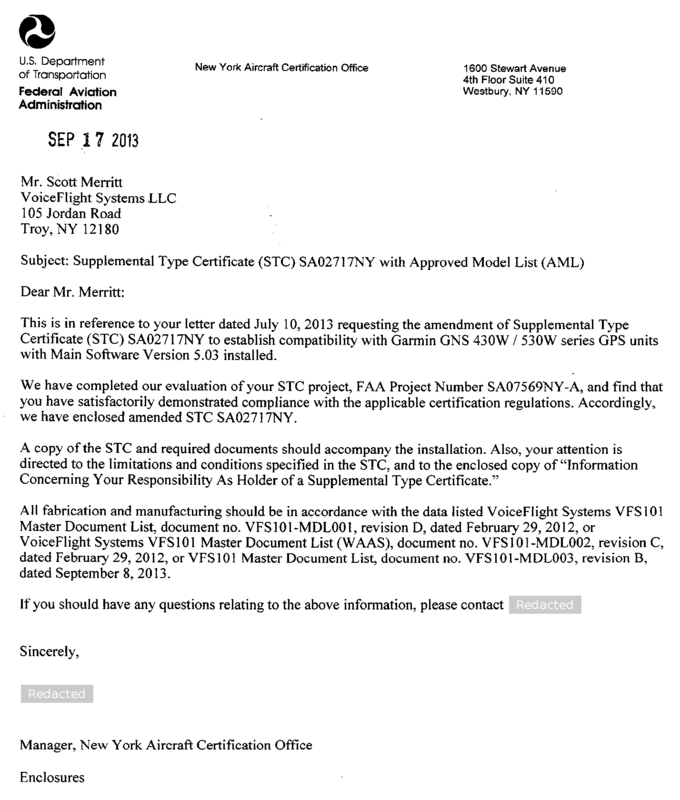 VoiceFlight has received an amended STC and amended AML that now include numerous Part 23 aircraft over 6,000 lbs. The Documents page of the VoiceFlight website has been updated with the revised documents. The new aircraft are listed at the end of the AML (rows #116 - #146). We are pleased to report that the existing VFS101 Software Version 3.2.3 does indeed operate with Garmin's new GNS Main Software 5.10. This configuration has been included in the Amended STC dated 5-Mar-2014. VoiceFlight has received an amended STC that includes operation with Garmin's GNS 430W/530W Version 5.03 Main Software update. The new VFS101 software (Version 3.2.3) fully supports expanded flight plans (with 100 waypoints) and includes a new feature that allows pilots to omit intersection waypoints when entering a sequence of airways. The Documents page of the VoiceFlight website has been updated with the new reference manuals for the amended STC. 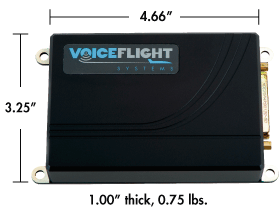 VFS101 units with the updated software are in stock and available for immediate shipment from our network of 85+ VoiceFlight Dealers.
" I had Voiceflight installed in my Cardinal about 3 years ago and have been very happy with it. I was saddened to see it discontinued ..."
Skeptical about the accuracy and reliability of our speech recognition? Don't think it will work with your voice?